In this lesson the author examines the social issues of church and state, masters and slaves, wives and husbands, social relationships, and living within one’s cultural customs, or social order. Overarching this entire week’s lesson is the foundational issue that begs the question of “how to do” these interpersonal relationships. That foundational issue is this: there are only two kingdoms, the domain of darkness and the kingdom of the beloved Son. No person is on the fence between the two. Either one is spiritually alive, having placed his or her faith entirely on the Lord Jesus and His finished work, or one is dead, perhaps equivocating with trust but not fully committed to forsaking all else and clinging to Christ alone. Whether one is alive or dead, spiritually, determines how one navigates Peter’s (and Paul’s) counsel on social relationships. The indicative statements of the Christian life are the statements that declare what is absolutely true about us. It is these truths that make it possible for us to tackle the imperatives. In 1 Peter 3: 9, therefore, we learn two unfavorable facts. The true believers were called. Earlier the lesson addressed Peter’s address to the church saying they were chosen according to God’s foreknowledge. The lesson downplayed the significance of God’s foreknowledge and election, saying that essentially God knows in advance who will choose Him. The Bible, nevertheless, declares that God, who is utterly sovereign, chooses His own for His purposes Verse 9 declares that a born-again believer can KNOW that he or she is called by God. Then we learn a second indicative: a second fact about ourselves as God’s born-again children: we are chosen “for the very purpose” of inheriting a blessing. If a person is not born again, is not placing all their trust in the Lord Jesus, these indicative statements will not make much sense. They will seem like metaphorical “maybe” statements, not reassurances of absolute truth. When we are born again, however, the Holy Spirit confirms our identities and our position in Him to us. Then, in verse 13, Peter rhetorically reminds his readers that, if they are truly God’s children, no one can harm them, truly harm them, if they are zealous for “what is good”. Oh, God’s people may be tortured or persecuted or may suffer loss, but this indicative statement reveals that a person born of God cannot be harmed in any real sense. These facts—that the born again are called for the purpose of inheriting a blessing and that no one can truly harm them—make it possible to consider the imperatives. A non-born-again person may go through the motions of the imperatives and may even do some good for others, but they will not have confidence and assurance and will not know how to trust God as they walk through the hard assignments of submitting to God’s imperatives which He gives to His children. Moreover, a person who has not truly trusted Jesus will not be able to do those imperatives. They will ultimately rationalize why the words of Scripture cannot mean what they appear to mean. Without the life of the Holy Spirit making them alive, the living words of Scripture will not make sense. 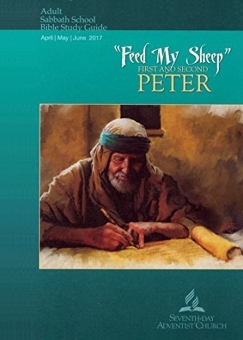 Peter reminds the believers that even if they suffer “for the sake of righteousness”—importantly, he is not referring to suffering for political agendas but righteousness, a word which refers to the righteousness of God which is credited to believers when they trust Jesus—they are not to fear men. Instead, because they know absolutely that they are secure: called for a blessing and unable to be truly harmed. They are always to face misunderstandings and persecutions with an internal attitude of sanctifying Christ as Lord in their hearts. Seeing themselves as submitted to their true master makes it possible for them to stand firm and give an honest account for the truth of the gospel to anyone who asks—but not with snark or anger. Because they are sanctifying Christ as their Lord, they can give gentle and reverent answers—even in the face of threats. The expectation is that believers—real, born-again believers—will suffer for the sake of Christ. It is better to suffer for Him than to suffer for doing evil. Because a true believer knows he is chosen and called for the sake of inheriting a blessing, he can live truthfully and speak honestly with respect, gentleness, and reverence. We are to serve bad bosses as if they were the Lord, “doing the will of God from the heart”. We are not able to serve people this way unless we really know the Lord and are spiritually alive. We can attempt to apply biblical principles if we’re not born again, but we have absolutely no way to do God’s will from the heart unless God is dwelling within us. In fact, not only are we to serve bad masters as we would serve the Lord, not treating them as men but as we would treat the Lord, but believing bosses are to treat their employees the same way. Scripture gives us no exception for unfair treatment. We are to treat everyone as if we are serving the Lord. This imperative is premised on the indicative, true only for those who are born of God, that we will receive back from the Lord whatever good we do. Because we can know that our obedience to the Lord Jesus, serving Him as we serve difficult humans, will not be unnoticed, we can KNOW that the Lord God will give back to us whatever good we gave to others. Here again we have to take the words Peter writes as meaning exactly what they say. To be sure, Peter is addressing the subject of believing wives and unbelieving husbands. However, that is not the only meaning to his words. In fact, Peter’s reference to Sarah obeying Abraham lets us know that this passage applies to believers married to believers as well. Speaking as a woman and a wife myself, I can absolutely say that believing women must trust the Lord Jesus and submit to their husbands, as Sarah “obeyed Abraham, calling him lord (1 Peter 3:6). Now, please do not hear me saying a husband ever stands in the place of the Lord Jesus in a woman’s life. When we see this passage, however, in a similar way we look at the admonition for slaves and masters to serve one another as if they are serving the Lord, the imperative statement makes more sense. In other words, a wife must place her faith and trust in God, knowing that even a human husband might thoughtlessly put her in a tight spot, however unknowingly. After all, Abraham is the one who asked Sarah to lie about being his wife and put her at risk as Abimelech and the Egyptian pharaoh took her to be part of their harems. It is “without being frightened by any fear” that is the key passage for a believing wife. An unbeliever cannot live this way. Only a born-again wife can know that the Father will be her protecter and defender even if a husband insensitively hurts her. It is fear that causes us to become destructive; trusting God’s promises, however, puts us in a place of absolute security. Our true Father is the One who guards and protects us and gives us the ability to love and respect our husbands. Similarly, it is the Father who gives His born again sons the ability to see their wives not as threats or obstacles but as beloved helpers who share both the burdens of life and the “grace of life”, as Peter says in 3:7. We live in the culture of our times. God has chosen our place and our time and our circumstances. The true gospel can enter any culture and flourish. It is not like legislation that develops laws to guard people’s pet interests; rather, it is something that changes and flourishes culture from the inside-out. As people trust the Lord Jesus and are willing to release their grasp on whatever they think is non-negotiable apart from the Lord Jesus and His word, they are changed. They receive spiritual life and are sealed by the Holy Spirit. As people become alive and realize the only thing worth defending is the reality that the Lord Jesus paid for sin and ushers us into fellowship eternally with Himself, culture changes. Our hearts are made new, and we are able to treat one another with the actual love of Christ. All our relationships and values look different when we see with the eyes of the Spirit and know with the mind of Christ. The gospel indicatives tell us that no one who has not been born of God can do the gospel imperatives. When we repent of our sin and trust Jesus, however, the gospel indicatives become true for us. We finally have the power of the triune God credited to us and available to us. We can live as saints in a sinful world because of Jesus’ sacrifice and resurrection, because of the Holy Spirit’s indwelling presence, and because the Father has adopted us!